As part of the agreement protocol all write requests from clients are forwarded to a single server, called the leader. The rest of the ZooKeeper servers, called followers, receive message proposals from the leader and agree upon message delivery. The messaging layer takes care of replacing leaders on failures and syncing followers with leaders. 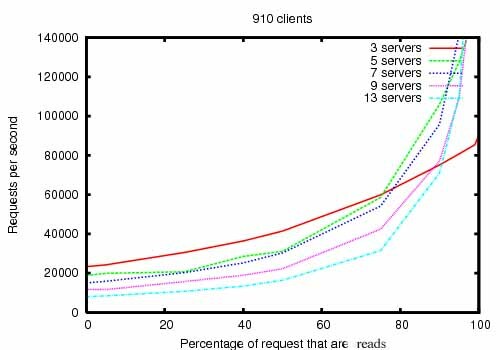 The figure ZooKeeper Throughput as the Read-Write Ratio Varies is a throughput graph of ZooKeeper release 3.2 running on servers with dual 2Ghz Xeon and two SATA 15K RPM drives. One drive was used as a dedicated ZooKeeper log device. The snapshots were written to the OS drive. Write requests were 1K writes and the reads were 1K reads. "Servers" indicate the size of the ZooKeeper ensemble, the number of servers that make up the service. Approximately 30 other servers were used to simulate the clients. 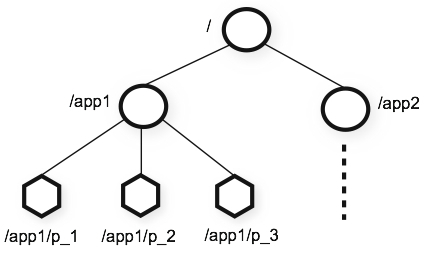 The ZooKeeper ensemble was configured such that leaders do not allow connections from clients. In version 3.2 r/w performance improved by ~2x compared to the previous 3.1 release. To show the behavior of the system over time as failures are injected we ran a ZooKeeper service made up of 7 machines. We ran the same saturation benchmark as before, but this time we kept the write percentage at a constant 30%, which is a conservative ratio of our expected workloads. The are a few important observations from this graph. 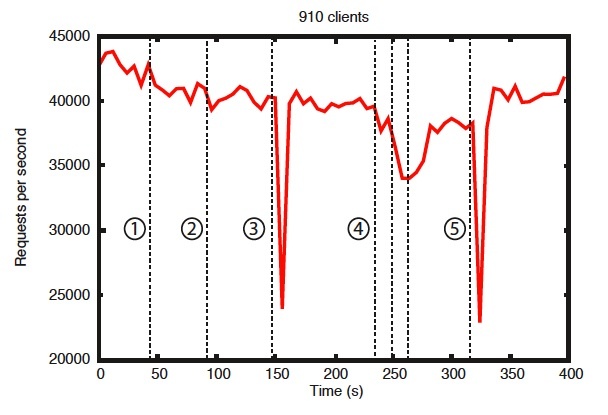 First, if followers fail and recover quickly, then ZooKeeper is able to sustain a high throughput despite the failure. But maybe more importantly, the leader election algorithm allows for the system to recover fast enough to prevent throughput from dropping substantially. In our observations, ZooKeeper takes less than 200ms to elect a new leader. Third, as followers recover, ZooKeeper is able to raise throughput again once they start processing requests. ZooKeeper has been successfully used in many industrial applications. It is used at Yahoo! as the coordination and failure recovery service for Yahoo! Message Broker, which is a highly scalable publish-subscribe system managing thousands of topics for replication and data delivery. It is used by the Fetching Service for Yahoo! crawler, where it also manages failure recovery. A number of Yahoo! advertising systems also use ZooKeeper to implement reliable services. All users and developers are encouraged to join the community and contribute their expertise. See the Zookeeper Project on Apache for more information.